12 | TH E M R EP O RT MCROWD JAMES B. LOCKHART III Sun Bancorp, Inc. the holding company of Sun National Bank, announced that the board of directors elected James B. Lockhart III as a Director of the company. Lockhart, Vice Chairman of WL Ross & Co. LLC, serves as a Director of Cascade Bancorp and its wholly-owned subsidiary, Bank of the Cascades, Oregon. As such, his election to the board is subject to the approval of the Federal Reserve Board under the Depository Institution Management Interlocks Act, which is pending. Previously, Lockhart served as the Director of Federal Housing Finance Agency and Chairman of its Oversight Board, and Director of its predecessor agency, the Office of Federal Housing Enterprise Oversight. Prior to that, he served as Deputy Commissioner and Chief Operating Officer at the Social Security Administration. In addition to his directorship at Cascade Bancorp, Lockhart serves as a Director of Shellpoint Partners. ROBERT J. LIPSTEIN Ocwen Financial Corporation announced that Robert J. Lipstein was appointed to the company's board of directors as an independent member. The company also increased the size of the board from eight members to nine. Lipstein is a former Partner with KPMG LLP; he also served as the Global IT Partner in charge of business services from 2014 to 2016 and as an Advisory Business Unit Partner in charge for its Mid-Atlantic region from 2009 to 2014. In January, he became a Director at Cross Country Consulting, a privately-held consulting firm that focuses on corporate advisory services. According to Ocwen, Ronald J. Korn, a Director at the company, has informed the board that he will retire from the Director position this May. Upon Korn's resignation, the board will be reduced from nine members to eight. Lipstein will serve on the board until the company's next annual shareholder meeting. VAN HESSER Kroll Bond Rating Agency (KBRA) announced the appointment of Van Hesser to the role of the head of the Financial Institutions group. Founded in 2010, KBRA is a full-service rating agency that provides risk assessment and ratings for the investment community. Hesser is also the Senior Managing Director of the Corporates group. He previously worked with Wells Fargo Principal Investments, where he led the Financial Institutions sector. Prior to Wells Fargo, he was at HSBC Securities for 10 years, where he served as the Global Head of Credit Research and was the Senior Corporate Bond Research Analyst covering U.S. banks, brokers, and specialty finance companies. Hesser has also worked with Credit Suisse First Boston, Goldman Sachs, Salomon Brothers, and the Federal Reserve Bank of New York. CHRISTY LONG HOSKINS First Community Mortgage (FCM), a wholly-owned subsidiary of First Community Bank headquartered in Murfreesboro, Tennessee, announced that Christy Long Hoskins has been appointed as SVP of Strategy and Chief Marketing Officer, where she will contribute to the development of FCM's overall strategic vision and lead all marketing, brandings, and advertising activities, with a focus on the customer experience-based Human Mortgage brand. 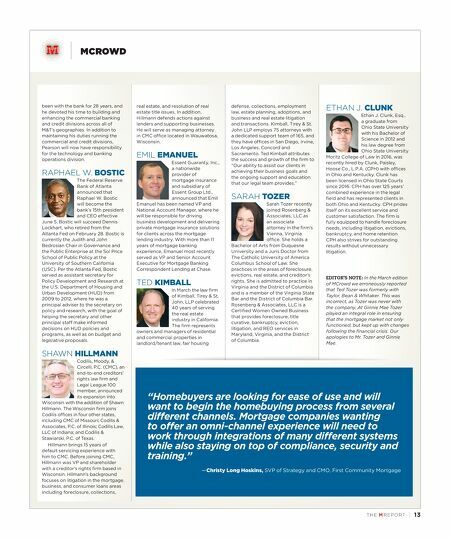 Hoskins is currently the Middle Tennessee Director for the Tennessee Mortgage Bankers Association and former President of the Nashville Mortgage Bankers Association. She was also named the Greater Nashville Realtors' Inaugural Affiliate of the Year in 2016 and was the recipient of the Tennessee Mortgage Bankers Association Community Development award in 2015. ROBERT CROWL, PHH Corporation announced that its CFO since 2012, Robert Crowl, will become President and CEO effective on June 28. Crowl succeeds Glen Messina, who will step down as President and CEO and not stand for re-election as a Director. Michael Bogansky, who previously served as SVP, Controller, has been appointed CFO. James Egan, Non-Executive Chairman of the Board of PHH, said "Rob has been an invaluable partner to Glen and the Board in executing our transformation and we are fortunate to have an executive of his caliber available to step into the CEO and Director roles." RICHARD S. GOLD, RENÉ F. JONES, AND KEVIN J. PEARSON M&T Bank Corporation announced last month that the duties of former President Mark J. Czarnecki, who passed away in February, have been assumed by M&T Bank's three Vice Chairmen, Richard S. Gold, René F. Jones, and Kevin J. Pearson. Gold has been with M&T for 28 years and worked in several business lines before being named Chief Risk Officer (CRO) in 2014. Now, after successfully leading the bank's risk division, he will be moving on from the CRO role and assume responsibility for retail banking, business banking, mortgage and consumer lending and marketing, and he will also maintain his responsibility for the legal division. Jones has been with the bank for 25 years and has held a variety of leadership roles, including CFO for 11 years. In addition to maintaining his duties running Wilmington Trust and the Treasury Division, Jones will now also have responsibility for human resources and M&T's Buffalo Promise Neighborhood initiative. 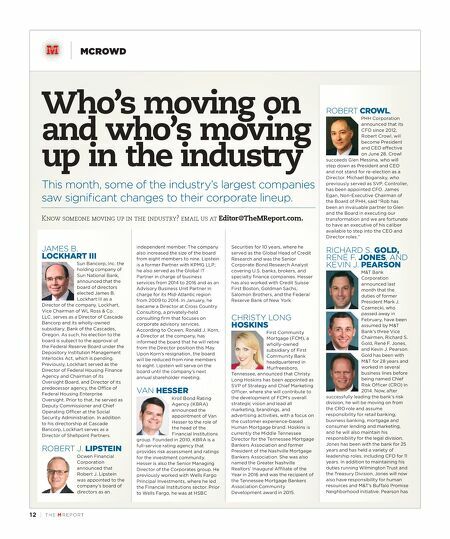 Pearson has Who's moving on and who's moving up in the industry This month, some of the industry's largest companies saw significant changes to their corporate lineup. Know someone moving up in the industry? email us at Editor@TheMReport.com.